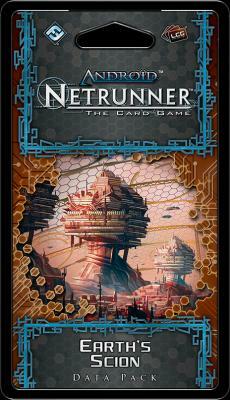 HomeCard GamesAndroid NetrunnerEarth's Scion Data Pack: Netrunner LCG Exp. Earth's Scion Data Pack: Netrunner LCG Exp. New Miracles for a New World. Who will control Mars? Every twenty-four hours and forty minutes, the Big Four insinuate more of their products, services, management, and agendas into every aspect of Martian life, and in Earth's Scion, the third Data Pack in the Red Sand Cycle for Android: Netrunner, we watch as their presence spreads more fully across the whole of the red planet. Can the runners who migrated across the solar system for a taste of freedom push back against this corporate expansion? And what role will the Martian Clans play? Will they trade generations of grudges and tradition for easy corporate credits? Will they feed vital information to buccaneering net jockeys? Or will they play both sides against each other? With fewer resources to go around, all factions must experiment more and play it less safe. The biggest question is—what are you prepared to sacrifice? The sixty new cards (three copies each of twenty different cards) of Earth’s Scion reveal how far some factions are willing to go in order to see their vision for Mars come to pass.